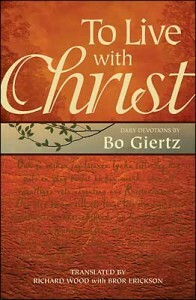 The devotional writings of noted Swedish pastor, bishop, and author Bo Giertz offer what foreword writer John Pless calls “sturdy confessional Lutheranism with warm piety born of confidence in the Gospel.” To Live With Christ translates a collection of Giertz’s classic devotions for those who want to explore their Christian faith and to connect God’s Word in their daily lives. The following devotion is for the Monday after Last Sunday in the Church Year (November 24). Revelation, with mysterious and suggestive visions, describes how order in the world falters during the final days. It looks as though evil has been victorious. The State, which was supposed to uphold the law, becomes a totalitarian state. There is one misfortune after another. The Church becomes a persecuted minority that exists covertly. Everything is in the hands of a world power that is an enemy of God, symbolized by the beast, the great prostitute, and the evil city of Babylon. Then, however, a mighty voice resounds from heaven: “Fallen, fallen is Babylon the great.” God has intervened and “mighty is the Lord God who has judged her” (Revelation 18:8). The evil city collapses, her smoke rises up, and all her admirers see it from a distance with terror and anxiety, similar to what you see when a mushroom cloud rises over a city hit by a nuclear bomb. What is the great city of Babylon? It got its name from Babel that once upon a time was the city of oppression and captivity, a proud city that laid claim to controlling the whole world and didn’t have to fear either God or man. Already among the Jews, Babel was a symbol for an earthly kingdom, for the devil and all his power, for everything that was against God. For the ancient Church, Rome was the new Babel, since the blood of martyrs was shed there more than any other place. John and all of his contemporaries had heard about this. Refugees had told them how Peter was crucified and Paul was beheaded and how their brothers and sisters—among whom the Christians in Asia Minor had relatives and old friends—had been torn to bits by wild animals in the amphitheater and been burned liked living torches during the nightly parties in Nero’s gardens. It wasn’t strange that Rome was seen as a new Babel. At the same time, however, the great Babylon was something more. It’s the timeless symbol for all the arrogant, self-important, wealthy, and inconsiderate world powers that are hostile toward God, that deny Him and put themselves in His place. That’s why it says (in the last verse of this chapter) that all martyrs, from all nations and throughout all time, have shed their blood in that city. Now it’s over, however. Suddenly the end is here. During all of the previous miseries, the evil one has strengthened his grasp on people. Now, however, it turns out that in some way it has weakened itself and undermined its own power. It can’t create, can’t restore, only exploit. And it destroys whatever it exploits. When the time is right, God’s judgment will fall, and then everything is over. And at the same time everything will be new. Now it’s God’s time to create and renew and make everything right. Lord, You Yourself have said that here it’s a matter of faith. When it looks like all those who deny You have all the power. When those who mock are triumphant and sneer and seem to be dead sure. When faith in You seems to be trampled on or is extinguished in the ice cold environment of doubt. When the whole world seems to be in agreement that You were wrong or that You don’t even exist. Lord, I know that there’s only one thing I have to adhere to: You alone. Your voice that I can hear. Your Word that lives in my heart. Your Communion where I meet You. Everything the world doesn’t see. All that can’t be proven but can still convince my heart. Lord, I believe. Help my unbelief. To order To Live with Christ, please contact CPH at 800-325-3040 or visit www.cph.org.